For Puerto Rico's Children, Finding A 'Safe Place' In The Few Schools That Are Open : NPR Ed A small number of Puerto Rico's schools have opened again. 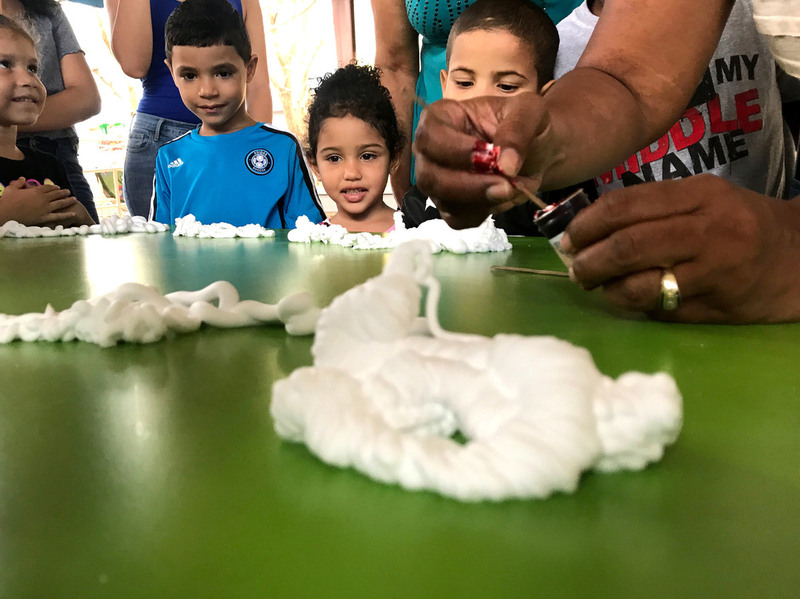 Two in San Juan are facing different challenges, but communities in both came together to provide a sense of normalcy for children. Nora Ortiz Navarro, the social worker at Escuela Gaspar Vilá Mayans, leads students in exercises to help them deal with stress and feel calm. Back-to-school season didn't last long this year in Puerto Rico. First Hurricane Irma and then Maria forced schools to close and turned the lives of students and their families upside down. 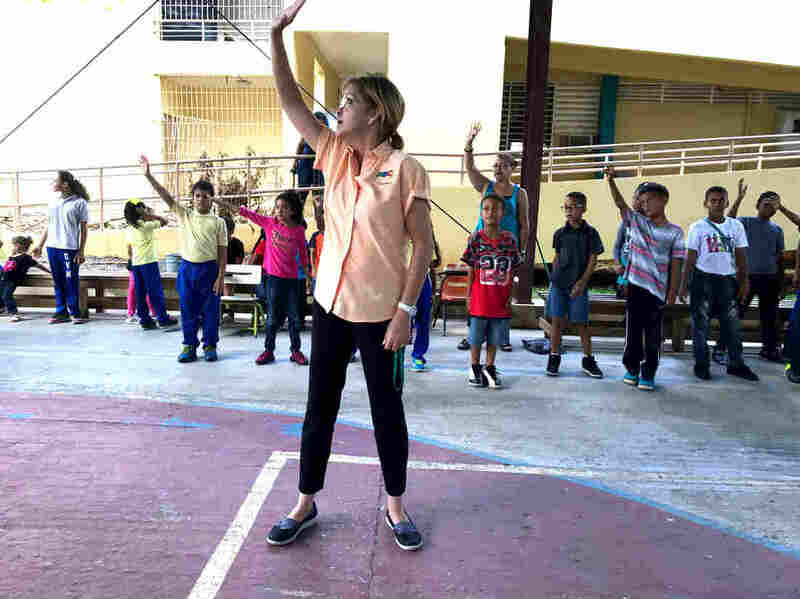 Puerto Rico's secretary of education, Julia Keleher, says that of the U.S. territory's 1,113 public schools, 22 reopened last week and another 145 this week. They're hoping that the majority will be open by Oct. 23. Some are still functioning as emergency shelters. To get an idea of how children and teachers and parents are coping, we visited two different schools in San Juan last week. They're among the lucky ones that have been able to open their doors and welcome students back. Down a hallway at Saint John's School, Nina Mendez-Marti is teaching an art class for high school students. During the hurricane, her family's roof tiles blew off. She lugged the terra cotta fragments to school in bags. Then, she asked her students to paint them, and "to think about that moment when the hurricane was coming." This elite private school, with more than 800 students in preschool through 12th grades, came through the storms relatively unscathed. Saint John's, which costs up to $12,000 a year, also has two diesel generators to keep the lights on and the air conditioning running. 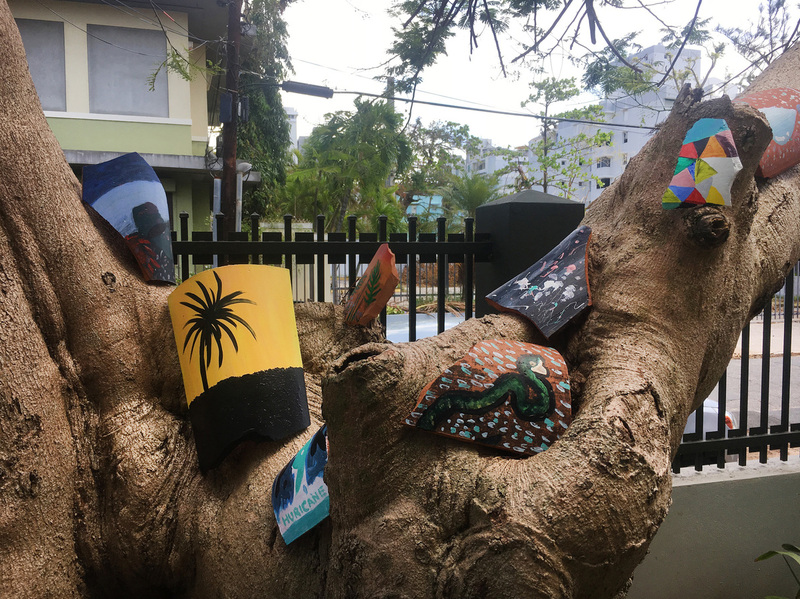 At an art class in Saint John's School, high school students were asked to paint roof tiles that were damaged in the storm. And so just a week after Maria hit, the school welcomed students back. Now, kids are eating lunch, chatting, playing board games and trying to come to grips with what happened. Lorraine Lago, the head of school, believes they were one of the first schools here to reopen. "The way for us to help Puerto Rico recover was to get up and get going and sort of lead the way," she says. "I had my doubts, I'll tell you: 'Is this too soon? Are we pushing?' But people needed to see each other." Not all of the students are back, though — some have left the island and are receiving their lessons remotely. Some of the older students who came back in the first week were put to work, Lago says, with an assignment to figure out a real-life math problem: "How are we going to plan when we open school if we don't have power? How long is our diesel going to last?" Another big challenge is the lack of Internet access. "We're sort of going old-school," Lago says. "We're doing, you know, paper, pencil projects." And the school is setting up a Wi-Fi hotspot for those nervous graduating seniors applying to college. Beyond getting the academic year back on track, though, Lago says teachers are really worried about their students and trauma. "The anxiety before the hurricane for the little ones was really intense," she explains. "I think the teenagers hold a little more anxiety now about, you know, what does this mean? Some are facing the reality that life is frail." Outside, where her students' terra cotta artwork is drying in the sun, decorating a tree, Nina Mendez-Marti points to a jagged tile fragment. It's painted black, with white and pink splotches. It was decorated by one of her students who experienced the aftermath of the hurricane from the roof of her house. "She talked about the fact that she saw so many dead animals and dead trees and death around her," says Mendez-Marti. But, the teacher adds, the pink and white splotches represent hope. It's early in the morning, and students are lining up at Escuela Gaspar Vila Mayans, a public elementary school in a low-income area in Rio Piedras that usually has about 200 kids. "PRESENTE!!!" about 40 kids shout on cue — they're the ones who are able to be present. More than three quarters of the student body isn't here. Communications are spotty, so some may not be aware that this school has reopened. 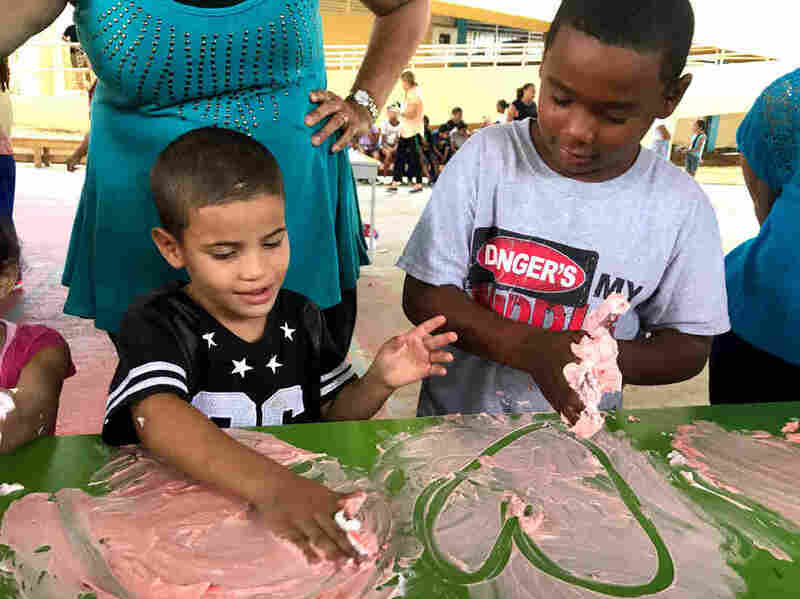 Principal Rita Barreto says many kids and their families are still dealing with the storm's devastation, after losing "almost everything," she says, "the clothes, the furniture, the food." For some students, even their homes. The school is open during mornings now, as of last Wednesday, and it's not clear when it will be back to full capacity. It has water, but no power. "This is a safe place," Barreto tells the students. "We are going to have breakfast, we are going to have lunch, we are going to have fun activities just so that you can have fun." The principal says some kids told her it was their first full meal since the storm. Ortiz Navarro at Escuela Gaspar Vilá Mayans leads students in an activity. Using colorful shaving cream, they are creating images that make them feel calm or help them see beauty. On this morning, they're dishing up oatmeal and apple sauce. Kids sit around bright green tables. Parents and kids from other schools are also welcome to eat, and the leftovers will be handed out to elderly members of the community. Yeny Fernandez, who has three boys, is eating at the school this morning. After Maria, "The little food we had left got eaten quickly; we didn't have enough food to give them," she says. When she found out that the school would open, her boys couldn't sleep because they were so excited. In fact, Barreto says that while it was closed, the students reminded them of the urgency to open again. "They were just going around the school and asking and asking and asking again," when school would start. Community members banded together to remove tree branches and debris from the school grounds. Barreto shows us what used to be the first-grade classroom. It's badly damaged, with portions of the roof gone and more heaped in soggy piles on the floor. A lesson is still written on the whiteboard. We don't spend much time here. The new first-grade classroom is decorated with colorful flags and a mobile. Handprint art is up on the walls. Hearts are popular with the kindergarteners, while third-graders finger painted more houses. On this day, students are drawing pictures about how they experienced the hurricane. "It was raining so fast," says 10-year-old Cristopher Cruz, as he shows a picture that he drew of flooding in his building. A few minutes later, the school's social worker, Nora Ortiz Navarro, is leading a group of attentive students in an exercise about dealing with stress. She instructs them to slowly breathe in and out. They inhale, raising their arms, and exhale, lowering them again. Then, the kids use shaving cream to finger-paint things that they think are beautiful, which they can focus on during tough times. Hearts are popular with the kindergarteners; third-graders are more into houses. Is Ortiz Navarro, the social worker, worried about the time students have lost to the hurricanes. The priority is making sure they're OK emotionally, she answers, adding that she believes the students are in some cases faring better than the adults. "The most important aspect is the support," she says. "Hearing them out, doing exercise, distracting their minds from what happened a few weeks ago, at least for the time being, while we help them get their mind set more relaxed in order to start studying." The ground is clear here, but the trees were all but destroyed. Two weeks after the storm, Barreto points out the leaves that are slowly starting to grow back. "The most important thing for me today and tomorrow ... is that they can come here, and they can just share, and if they want to cry, they can cry. If they want to just play, they can play," she says. "But it's really important for me that they found their place again."